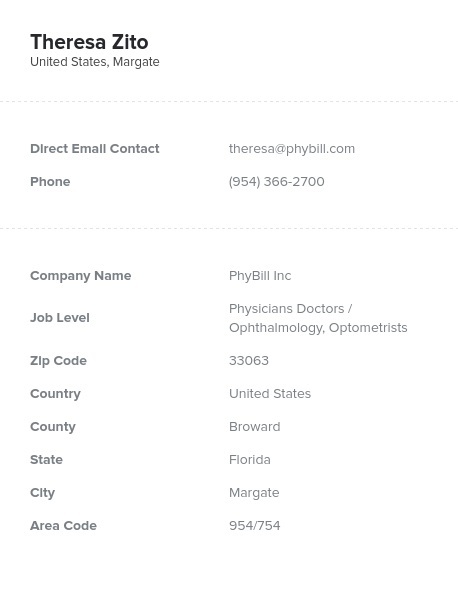 See key contact information of eye doctors interested in your products and services, organized into this one ready-made email database. Buy our human-verified ophthalmologists and optometrist email list and start marketing within minutes. Marketing a new eyeglass product line, unique lens, contacts, eye-care product, contact solution, cleaning and repair kits, or another eye-related product? If you want your eye-oriented solution to be used, don't market to the masses. Network with ophthalmologists and optometrists who can become familiar with and recommend your product to their patients. Eye-care products range from the exclusively cosmetic to hygiene-relevant to diagnostic to heath-oriented. If you have a product that can help patients have a better, prettier, and more sanitary eye regimen, then let them know by conducting a B2B marketing campaign to engage their doctors. Ophthalmology relates to diagnosing and treating illnesses of the eye, whereas optometrists largely treat vision issues with prescribed glasses, contacts, or other vision treatments. Both groups talk with those with vision loss on a nearly constant basis. A large percentage of people require either glasses or some other product for optimum vision, whereas those who need treatment of more severe issues are much more rare. This mailing list contains the vital contact information of both ophthalmologists and optometrists: email addresses, names, postal addresses, and more. With this dynamic data product, you can email leads, directly mail samples or products, or call eye doctors to discuss your product or regimen. Find sales leads at hospitals, clinics, and offices in one database. This resource can help your business and is ready for you to download and integrate into your CRM now! Our data is verified by automated processes and human eyes. We're so confident about our contact lists that we provide a 95% accuracy guarantee. If more than 5% of your emails bounce, you'll get credits to make up the difference. Get an email list in minutes and download it instantly as a .csv file! Both file types can be integrated into your CRM application quickly and easily. So you can get started with making new connections right away. We provide direct, detailed, specific information to help you make more valuable connections with your future business contacts: emails, names, phone numbers, postal addresses, business titles, company/industry information, department information, fax numbers, revenue, and even employee information. Once you order the list, you own it! Our pricing is transparent; we don't charge extra fees for using the contacts we give you. There are no hidden fees or contracts. We charge the same low price regardless of if you're a small start-up or a large enterprise! For sure there's no another supplier that can provide better pricing with the same 95% email deliverability guarantee. Even if you find, we beat it directly! When were your data lists last updated? Our data is verified weekly. We have developed a complex algorithm for this purpose. With this algorithm, we check the accuracy levels of our data against millions of sources and apply necessary updates. How long does it take to get my email list after I order online? You can instantly download your database after your order is confirmed. I want to place an order, but I have doubts about the accuracy of the data. Why should I trust you? All of the records we sell have a 95% accuracy guarantee. If you encounter a lower accuracy rate, you can contact our customer relations staff and we will provide you new data for free to make up the difference. We call it our Bounce-Back Guarantee. Do customers download files as Excel files? We offer Excel files, .cvs files or .txt files.